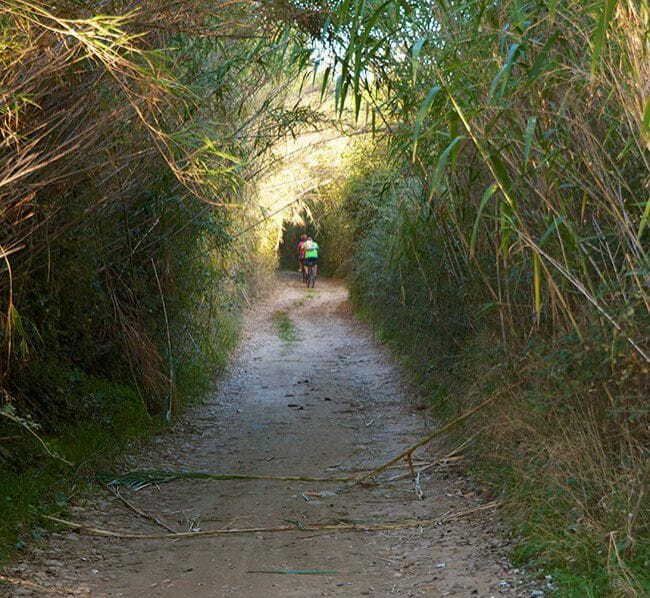 The stretch between Figueres and Vilanova de la Muga has two branches through Vilatenim or through Palol. As it passes through the town of Vilanova de la Muga this route is characterised by stretches of small paved cart tracks, with little traffic and sections of agricultural roads of gravel-compacted earth. All the routes have little slope and are not very difficult. There are two options for getting to Figueres, by Palol or by Vilatenim. The start in the town, on the hump that crosses the river Muga and take a left turn until you come to the town of Vilanova de la Muga, which has a shady resting area at the entrance (km 7.4), with a drinking-water fountain and a beautiful viewpoint of the river. After visiting the 12th- and 13th-century Romanesque church of Santa Eulàlia, make your way on the dirt track, following the signposts systematically. When you reach Vilanova de la Muga, carry on towards El Estanyol, Vilaüt and Roses. Beginning in Roses, the route starts past Les Torroelles, we take the old rural path from Roses to Peralada, passing through Escorial road, Avet road and Pica d’Estats road, until we reach Canigó road and Rhode avenue where the route finishes in front of the Citadel of Roses. The whole route coincides with the GR92.